The new nation of East Timor designated two languages as official languages: Portuguese and Tetum. Two other languages are considered as working languages: Indonesian and English. The language issue is an evolving one (as Tetum is being standardized) and among some sections of the population rather contentious. It is mainly some of the older people who had access to schooling during the Portuguese administration and the former freedom fighters who have some understanding of the Portuguese language. For the guerrilla fighters it was a language of subterfuge, a language not understood my Indonesian soldiers. Most of the younger generation that received their schooling during the Indonesian occupation, are fluent in the Indonesian language. For a discussion on East Timorese language situation during Indonesian occupation see Lutz 1991. The lingua franca and the vernacular adopted by the Catholic Church is Tetum. 6 of May 2001 Report from The Asia Foundation, entitled East Timor National Survey of Voter Knowledge (Preliminary Findings). “27% of East Timorese between the ages of 35-50 can speak Portuguese, as opposed to only 11% of those under 25.” Portuguese as an official language is contentious among many of the East Timorese people. Popular attitudes about the language situation which I have heard in many places as an election observer prior to the Constituent Assembly elections in 2001 did not seem to have changed much in 2002 after official independence. The more general views on the national language can be illustrated by the reaction of the people in the Atsabe subdistrict of Ermera district. The very first day I arrived to commence ethnographic research in 2002 in Atsabe, I was asked to give talks and hold discussion session with junior and senior high school students, and especially to provide English language lessons at the school. I was asked by teachers to use the mediating language of Indonesian to teach English and in return the students were to provide me with the local language, Kemak, equivalents. The students were fluent in both Indonesian and Tetum. More often than not students would provide Tetum equivalent in the first instance, as they could not recall vocabulary in Kemak. The high school teachers or principal also attended these sessions as they wished to learn English. Students receive Portuguese lessons as part of the new regular curriculum, however, both teachers and students expressed the view that they need to learn English since that is the true international language [their phrasing] and if they are to have future opportunities in education or jobs Portuguese will not help them much. At times an extremely strong anti-Portuguese language sentiment was expressed which reflected the general attitudes of the Atsabe Kemak who were vociferous in their critique of the national language choice with reference to future opportunities for participating in a global arena. In Atsabe subdistrict there was a very real lack of knowledge of and fluency in Portuguese by the vast majority of the people. People throughout Atsabe emphasized their cultural preference for Tetum lingua franca and ‘true national language’ [their phrasing]. They viewed Tetum as the essential bridge across the vast linguistic diversity of East Timor and an aspect of a Catholic identity. Thus from this perspective, the Atsabe people viewed Tetum (and not Portuguese) as an important marker of East Timorese national identity. The local Kemak language (several dialects of it) is only used in daily life and is often mixed with Tetum words among the 50 year olds and younger generation. In the weekly market, in Church, in interaction with people from other cultural groups, and among the youth Tetum is the language of choice. As pointed out above, the youth (in their 30s and younger) are more familiar with the Tetum lingua franca, and of course the Indonesian language that is the language of school instruction, than their own mother tongue. While official matters must be conducted in Portuguese, such as parts of the weekly flag-raising ceremony--the pledge and the national anthem,--most people will speak either (or both) Indonesian or Tetum even in the local sub-district administrative office. Official documents and correspondences are constructed in the Indonesian language. Fortunately most Atsabe Kemak are multi-lingual. Many will speak all the dialects of Kemak and speak Tetum fluently. Most people, with the exception of some elders over 70 years of age, are fluent in Indonesian or at least know some Indonesian. Some of the Atsabe Kemak, particularly those from Paramin village also know some Mambai, a situation due to the intricate marriage alliances they have with a migrant Mambai group that found refuge in Atsabe in the distant past. It is rare to find people who know Portuguese any more, except for some elders and some of the former freedom fighters who are not fluent but know some of the language. The majority of the population in Atsabe subdistrict speak Kemak and Tetum on a daily basis and in more official matters and schools they interact in the Indonesian language. Even the older generation does have some command of the Indonesian language. The total number of these fluent Portuguese speakers was estimated by local leaders to be less than 1% of the estimated total population (13, 080) of Atsabe subdistrict. However, it was not always clear to me whether this is a factual situation or more an issue of ‘silent resistance’ (cf. Scott 1990) to a national language choice and policy that was not favored by the majority of the Atsabe people. They expressed their resentfulness that no public consultation was conducted before Portuguese was made the national language. Even certain elder individuals who were high ranking civil servants in the local district, subdistrict and village administration during Portuguese times claimed no longer to know the language. For example, when some Portuguese UN soldiers (PKF) were dispatched to calm an outbreak of violence surrounding Obulo village, I was asked by high status local community leaders to find out if the soldiers spoke English and then to translate to them the community leaders’ report and assessment of the situation based on their intimate knowledge of local social dynamics into English! The English language was only known to a handful of teachers (2) and local policemen (2) who are far from fluent. The Atsabe Kemak continue to adjust their choices of code switching with every single circumstance and situation; utilizing language choice to emphasize aspects of cultural identity. However, the popular opinion has been that Tetum should be the national language since that is the most common form of everyday cross-cultural (meaning across different linguistic-cultural groups of East Timor) communication. It is this language that is the most commonly heard form of communication in public forums in Atsabe subdistrict and is the vernacular of Catholic Church services. There is an ambiguity about the use of the Portuguese language. Portugal is one of the donor nations of East Timor, albeit not the largest donor by any means. Portugal’s major contribution is in the field of education. Portugal has sent teachers and textbooks to train the younger generation in the official language, which is only known to a small minority of the entire East Timorese population. East Timor as a newly independent nation is in the process of carving out a new national identity, not just as the newest Southeast Asian nation but also as member of the Portuguese speaking nations of the world, thus emphasizing both a regional and global identity. Positioning itself in the global community as a member of Portuguese speaking nations is also an aspect of the new East Timorese government’s discourse on national identity. It also seems to me however, that such ‘global positioning’ on the part of the new government, is also a form of justification and an attempt to quell general dismay for choosing Portuguese as an official language of Timor Leste despite of popular preference for the lingua-franca of Tetum. Nevertheless, the notion of being part of a larger international Portuguese speaking community continues to be propagated through media programs (radio and television in Dili, the capital) and newspapers. Indeed this international positioning was particularly emphasized during the summer of 2002 during the Soccer World Cup. East Timorese were glued to the television in the capital city, Dili, and were rooting for Brazil. The media encouraged support on radio, television and print media was couched in idioms of ‘Brazil is like a brother so they need our support’, and ‘they are also Portuguese speakers’. One would hear similar exclamations even in Atsabe where there is no electricity unless one owns a private generator and at best there is poor radio signal reception. Villagers who visited Dili at the time, upon their return to Atsabe were agents of propagation for this discourse. Thus, even those who did not watch any part of the tournament nor read newspapers picked up on these ‘globalizing’ phrases, particularly the expression that called Brazilians brothers since they also experienced Portuguese colonialism and spoke the same language. Language teachers from Portugal in the Atsabe subdistrict also encourage the rhetoric of ‘brotherhood’ and membership in the global community of Portuguese nations not just in their classroom lessons but also in their wider interaction with the community. Sundays, usually after Mass, the teachers have many invitations for visiting various households (not just of the elite) and during these occasions the rhetoric is often heard in one form or another. I have been asked to accompany the teachers so that I could translate during such visits. These interactions provided for some fascinating linguistic gymnastics between Portuguese, English, Tetum, Kemak, and Indonesian languages. The Portuguese teachers preferred to talk to me in English but sprinkled in a lot of Portuguese when they had difficulty expressing themselves. My offers to keep it to Portuguese they declined. Then their dialogue I would translate into the language preferred by the households Indonesian, or mixed Kemak and Tetum languages. At times the translation would completely switch to Kemak with only a few Indonesian phrases slipped in for concepts not easily expressed in the Kemak language. National attempts at carving out a place in the global community are reaching places like Atsabe and the national discourse on identity is made part of local reformulations of identity (cf. Appadurai 1996). This idea of being part of a global community was expressed in yet another manner. A frequently recounted story also surrounded the first time that the UN flag was lowered and in its place the East Timorese flag was raised (in May 2002). According to the various local accounts, people were in tears for days and produced a special hand woven textile (tais) in which to wrap the UN flag, as if it was a death shroud, but also to protect it and to preserve its mystical ‘sacred’ power (luli). This flag came to symbolize liberation and protection but more importantly a recognized place in the global union of nations as a country in its own right. In September 2002 East Timor became the 191st member nation of the UN, a milestone event that was celebrated and much publicized in local media. Atsabe Kemak insisted on raising UN flag, which in 2002 was flying on a post outside the sub-district administrative compound. Initially Atsabe people wanted to see their own national flag flying beside and next to the UN flag but for practical reasons (where the flag poles were located) the two flagpoles now diagonally face each other. The UN flag not only came to symbolize liberation to the Atsabe Kemak, but a newly found possibility of ‘imagining’ a rightful membership in a global community. The Portuguese language provides the Atsabe Kemak, as other East Timorese, for a way to imagine themselves as parts of a larger global community of Portuguese-speaking nations. The language issue is never the less contentious. Anderson’s (1993) discussion on “Imagining East Timor” during the Indonesian occupation also highlighted the issue of language (see also Lutz 1991). Whereas colonialism ended in the rest of the world several decades ago for the East Timorese, the Indonesian occupation resembled yet another form of colonialism (Anderson 1993). Colonial languages usually served as a window on the rest of the world (ibid), however, for young East Timorese the Indonesian language provided this medium. The new national language policies of East Timor extend this ‘linguistic window’, and thus Portuguese, Indonesian and English will become means of locating the local populations vis-à-vis the global. Although in the East Timorese case the language issue plays an important role in defining the new nation, it is only in relation to East Timor’s historical experiences and current processes of seeking a place within the international community as a Portuguese-speaking nation. The Atsabe Kemak feel rather ambiguous, however, towards the use of the Portuguese language. On the one hand, the label of a Portuguese-speaking nation secures a place in the global community. The use of the Portuguese language as a national language, however, has less to do with a historical continuity or the past commemoration of colonial historical experiences. The use of Portuguese is rather a recognition and commemoration of the decades of guerrilla war against Indonesia that resulted in the final establishment of this new nation, as Portuguese was the language of the freedom fighters. Therefore, Portuguese, while not popular, is being considered a symbol of newly gained freedom of a young nation. On the other hand, Portuguese as a national language is ‘resisted’ for several reasons. The majority of the population in Atsabe subdistrict speak Kemak and Tetum on a daily basis and in more official matters and schools they interact in the Indonesian language. Even the older generation does have some command of the Indonesian language. Only those few elders who have served in the Portuguese army or civil service (and a handful of former freedom fighters) know some Portuguese and the total number of these fluent speakers was estimated by local leaders to be less than 1% of the estimated total population (13, 080) of Atsabe subdistrict. For one thing, in local perceptions of a cross-cut of the subdistrict’s population (regardless of age, gender, and other social status) Portuguese limits access to interaction with a wider global community in terms of economic and technological development. Thus, Portuguese is being viewed as not ‘international enough,’ with a local preference for English. Another reason cited by Atsabe community leaders concerned the fact that young East Timorese received their education in the Indonesian language. Since there is an insistence on using Portuguese in official matters, young people cannot contribute to ‘immediate’ nation building and development. Furthermore, the very real lack of knowledge and fluency of Portuguese by the vast majority of the people and a cultural preference for the Tetum lingua franca, which is also the vernacular of the Catholic Church, were also emphasized among the Atsabe people. 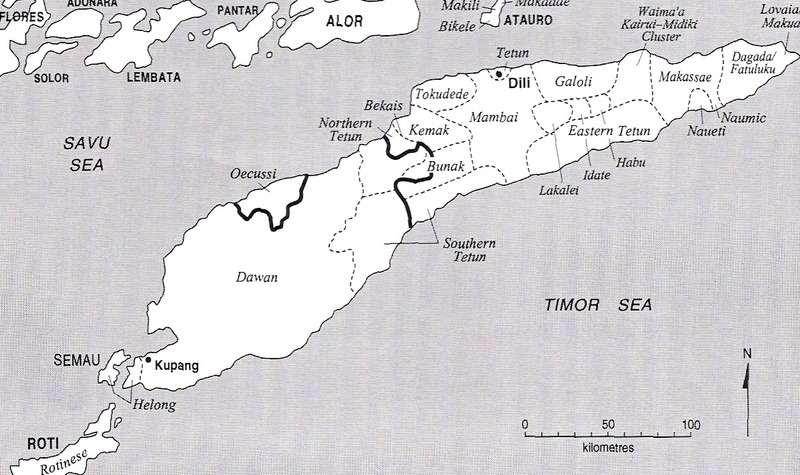 LANGUAGE MAP OF TIMOR—adapted from pp.4. of Fox, James J. 2000 “Tracing the path, recounting the past: historical perspectives on Timor”. IN Out of the Ashes: Destruction and Reconstruction of East Timor. pp. 1-29. Adelaide: Crawford House Publishing.